The Fours – English hills at and above 400m and below 500m in height that have 30m minimum drop. The hill is situated in the Northern Pennines and is placed in Region 35, Section 35A with its Cardinal Hill being Cross Fell (NY 687 343). The hill is positioned with the B 6277 road to its north north-east and has a number of reservoirs close by, including the Grassholme, Selset, Balderhead, Blackton and Hury, and has the small community of Middleton-in-Teesdale towards the north. When the listing that is now known as The Fours was originally compiled this hill appeared under the name of Millstone Grits, and when the list was uploaded to the RHB Yahoo group file database the hill appeared under the name of Millstone Grits (Harker Hill). 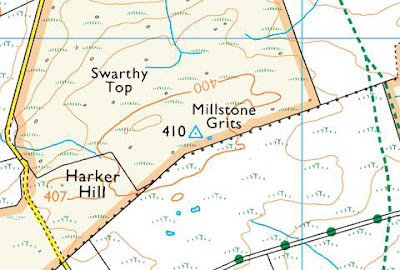 Subsequently the name of the hill reverted to just Milstone Grits in the 1st edition of The Fours when the list was published by Europeaklist in December 2013. Hill list authors are prone to list a hill by the name that appears nearest to its summit on contemporary Ordnance Survey maps, without much consideration for its local or historical confirmation, or whether map placement is appropriate, and in the case of this hill there are two names that are consistently applied near to its summit on different scaled Ordnance Survey maps, these names are Swarthy Top and Millstone Grits, with the latter nearer the summit of this hill on contemporary maps and hence this hill’s previous listing under this name. Since the original publication of this list on the RHB Yahoo Group file database there have been a number of Ordnance Survey maps made available online, some of these are historical such as the series of Six-Inch maps on the National Library of Scotland website, whilst others are current and digitally updated such as the Interactive Coverage Map hosted on the Geograph website. Therefore, prior to the publication of the 2nd edition of The Fours, Aled consulted the series of Six-Inch maps produced by the Ordnance Survey. For many years The Ordnance Survey Six-Inch map was the base map for information to be fed on to, the scale was superseded in the 1950s by the 1:10,000 series of maps and was available as sheets until the 1980s when they were digitised. One of the recurring themes of Ordnance Survey maps is that some of the data are not consistent between the different scales of maps available, this is particularly noticeable for numerical data between the two publicly available scales of 1:50,000 Landranger and 1:25,000 Explorer maps. 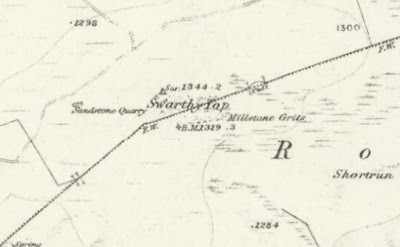 However, when studying place-names it is also noticeable that name placement and sometimes composition is not consistent between these lower scaled maps and their larger scaled and older maps of the Six-Inch series. It is also noticeable that some names appear on the Six-Inch map whilst they do not appear on the smaller scaled maps. Extensive research has shown that place-name data and numerical data on the series of Six-Inch maps, and especially so for the former’s placement, are more appropriate and accurate compared to much of the information on contemporary maps. Therefore, the name this hill is now listed by in The Fours is Swarthy Fell and although this name appears close to the summit of this hill on contemporary Ordnance Survey 1:25,000 Explorer maps, it is the Six-Inch map and its placement of this name that is being favoured in preference to that of Millstone Grits which is probably a name applying to a feature on the hill.